Outdoor air pollution has no boundaries. It‘s a problem in the city or in rural settings. Outdoor air pollution is a mix of gases and toxic particles in the air we breathe. Regular exposure can harm our health. Lots of things can cause poor air quality. For example, in the city, air pollution is caused by fumes from cars and buses. This is called ground-level ozone (or urban smog). Ground-level ozone increases in cities when the air is still, the temperature is warm, and the sun is out. This combination traps pollution in the air. Airplanes also cause air pollution. Other things, such as construction vehicles and tobacco smoke, also cause air pollution. In rural areas, outdoor air pollution often is caused by dust from tractors plowing fields, trucks and cars driving on dirt or gravel roads, rock quarries, and smoke from wood and crop fires. Air quality changes depending on several thngs, including weather conditions (sun, rain, wind, etc.). Other factors include the types and amount of gases in the air. There will be more gases from cars and buses during the workweek than on the weekend. New industry coming to the area, new plant vegetation in the area, and even new buildings add to air pollution. For example, the more buildings a city adds to a dense area, the more the pollution will be trapped. In rural settings, the season farmers plow their fields will add to air pollution. So what can you do to reduce your exposure to outdoor air pollution? Check the Air Quality Index (AQI): The U.S. Environmental Protection Agency (EPA) regularly measures and reports air quality in cities and rural areas. Because of this, air quality has improved over the last 20 years. Your local TV, radio, newspaper, and digital sources will often publish the AQI. The score ranges from 0 to 500. An AQI score of more than 100 means unhealthy air conditions. Stay indoors when pollution is high: Use the AQI to reduce your risk of going outside on bad days if you don’t need to. You may not be able to avoid leaving the house for work and school. However, you can choose avoid time outdoors at a park, a picnic, doing lawn work, etc. If you have to be outdoors, limit activity to the early morning hours or wait until after sunset. This is important in high-ozone conditions (such as in many large cities) because sunshine increases ozone levels. Avoid heavy physical activity on high air pollution days. The faster you breathe, the more air pollution you inhale. These steps will generally prevent symptoms in healthy adults and children. However, if you live or work close to a known pollution source, you will want to consider other ways to protect your health. If you have asthma or a chronic lung or heart problem, talk with your doctor about ways to protect yourself from air pollution. See your doctor if you have symptoms of chest tightness, burning eyes, or a cough. If you have asthma, your doctor may be able to prescribe a medicine to use long term or as needed when you have difficulty breathing. Certain groups of people are more sensitive to the effects of air pollution than others. 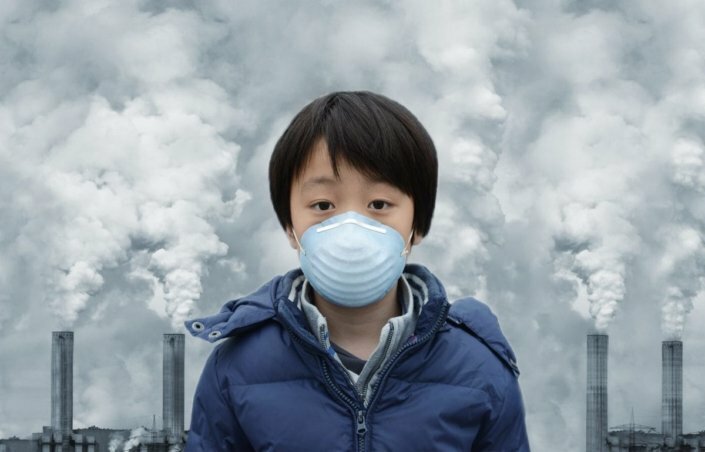 Children feel the effects of higher levels of pollution than adults. They also experience more illness, such as bronchitis and earaches, in areas of high pollution than in areas with cleaner air. Could my asthma be caused by air pollution alone? Can hives be a sign of exposure to air pollution? Does taking public transportation reduce air pollution? Why does my breathing seem worse on rainy days? How can I reduce my child’s exposure to air pollution during recess?